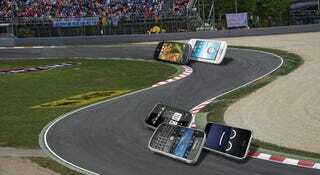 Smartphones have all advanced over the past few years, and mostly do the same things. But if you look at the details, you'll find that—depending on your needs—one may be way better than another. Note: We have updated certain notes in the chart to reflect the lively discussion going on in comments, and we want that to continue. That said, we plan to leave Symbian both out of this discussion and any future discussions of the hottest smartphones of the day because it has little or no presence in the US, where we are based, despite its popularity in other countries. We apologize for the inconvenience this may cause you. Apple is so fixated on maintaining a high level of user satisfaction and reduced frustration on the iPhone, they will bluntly admit to leaving out key smartphone features—particularly features that are either hard to implement in the UI, or require too much battery juice. The result is a pretty slick interface (with occasional glitches, yes, but fewer than others) that nevertheless leaves you wanting more. iPhone OS 3.0 (covered in full detail here) addressed most of the user gripes—such as lack of push notifications, copy and paste and search, but we're still left without video recording, Flash browser support and true background-app multitasking. Windows Mobile is brilliant for the business crowd because of its ability to support secure emails, work with corporate computer infrastructures and run proprietary business apps created entirely within Microsoft's device ecosystem. You can pretty much run and do anything you want on a Windows Mobile phone, which is great. But because the phones are made by many different competing companies—with no consistent quality assurance—UI and user experience don't compare to the other platforms, so the OS is not as good for people who want a fun smartphone for their own personal use. One major gripe especially revolves around the screen and its systemic lack of both finger-friendly capacitive-touchscreen support and multitouch interaction. WinMo feels really clunky when you use a finger, and you otherwise have to use an annoying (and easily lost) stylus. At this time, we are focusing on resistive touch because we wanted to ensure the highest quality across the entire experience on the phone, including in different applications such as Excel or Word. However, we have enhanced our software to help resistive screens act like capacitive in certain areas like the "gesture support" and "physics engine" that you see across the new UI of Windows Mobile 6.5 powered Windows phones. Hrm. Well at least they're acknowledging the need for better gesture support, and the need to mimic the capability of capacitive touch. We'd rather they just skipped all that work and upgraded, though. Android is the code monkey's dream. Because the OS is fully open source, you can do anything you'd like to the phone. This means pretty much any feature you'd like on a cellphone is possible on Android—even the officially unsupported multitouch interaction—provided someone can write an app or extension for it. The downside? Even the official Google/HTC/T-Mobile release of the G1 had a UI design that felt incoherent, like you're using four different OSes instead of one. Also, despite all this free love, there's only one currently available phone, and it's ugly as all sin. Note: For more information, you should read this detailed Android vs. iPhone piece by Gina at Lifehacker. Like Windows Mobile, RIM's BlackBerry is also a business-oriented phone, but with a much more coherent consumer initiative under way. Relatively intuitive and well-structured to use, it feeds off of an email server that is second to none in getting messages to you as they're sent. And since the phone only runs on BlackBerry hardware, you can mostly be assured the OS will run smoothly (mostly). But despite their best efforts to liven things up with the admirable 4.6 OS and the not-so-admirable BlackBerry Storm touchscreen edition, this remains a fairly utilitarian phone that serves one main purpose: superior messaging. Note: Blackberry was deemed to not have Universal Search because it doesn't search files or Applications. Palm's Pre with its all-new WebOS has the potential to be the closest competitor to the iPhone, merging the zen simplicity and beauty of the iPhone OS with some of the background processing power of an Android or WinMo phone. You can run as many apps as you like concurrently, and manage them using a system that lets you quickly flick through apps like it was a photo system, great for staying on top of many things at once. But it also integrates the internet into so many facets of its UI (search, contacts, UI, etc. ), that you might not even realize you're using the internet sometimes. If the iPhone is for the common man, WinMo for the executive, Android for the programmer and BlackBerry for the information junkie, WebOS could very much be for the savvy kids trying to stay on top of social media and Web 2.0. Let's see what happens when the thing actually ships. 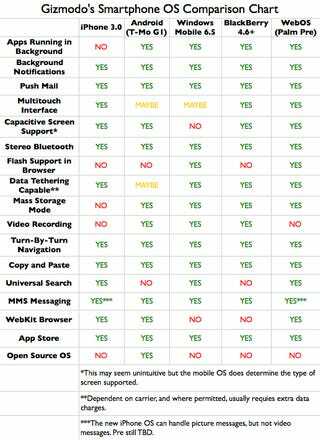 Anything you'd like to add about the differences between the smartphone OSes? This is obviously an overview meant to highlight the most crucial differentiators, but if you've got something you want to share that's a little more nitty gritty, please pop it into comments pronto. Still something you still wanna know? Send any questions about smartphones, dumbphones or megaphones to tips@gizmodo.com, with "Giz Explains" in the subject line.